Progressive retinal Atrophy, progressive Rod-cone degeneration (PRA-prcd) is a late onset, inherited eye disease affecting Nova Scotia Duck Tolling Retrievers. PRA-prcd occurs as a result of degeneration of both rod and cone type Photoreceptor Cells of the Retina, which are important for vision in dim and bright light, respectively. 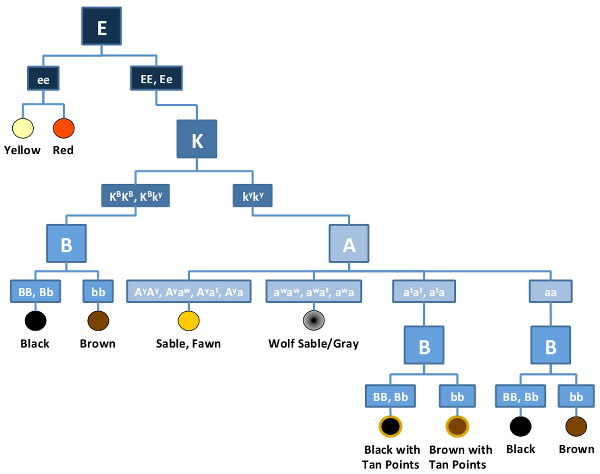 The age of onset varies between individual Nova Scotia Duck Tolling Retrievers with PRA-prcd. For most breeds, evidence of retinal disease in affected dogs can first be seen on an Electroretinogram around 1.5 years of age, but most affected dogs will not show signs of vision loss until 3 to 5 years of age or later. The rod type cells are affected first and affected dogs will initially have vision deficits in dim light (night blindness) and loss of peripheral vision. Over time affected dogs continue to lose night vision and begin to show visual deficits in bright light. Other signs of progressive retinal atrophy involve changes in reflectivity and appearance of a structure behind the retina called the Tapetum that can be observed on a veterinary eye exam. Although there is individual and breed variation in the age of onset and the rate of disease progression, the disease eventually progresses to complete blindness in most dogs. Other inherited disorders of the eye can appear similar to PRA-prcd. Genetic testing may help clarify if a dog is affected with PRA-prcd or another inherited condition of the eye. The Mutation of the PRCD gene associated with progressive retinal Atrophy, progressive Rod-cone degeneration has been identified in the Nova Scotia Duck Tolling Retriever. Though the exact frequency in the overall Nova Scotia Duck Tolling Retriever population is unknown, 47.7% out of 44 Nova Scotia Duck Tolling Retrievers from a population from Czech Republic were carriers of the mutation and 20.5% were affected. Genetic testing of the PRCD gene in Nova Scotia Duck Tolling Retrievers will reliably determine whether a dog is a genetic Carrier of PRA-prcd. PRA-prcd is inherited in an Autosomal Recessive manner in dogs meaning that they must receive two copies of the mutated gene (one from each parent) to develop the disease. In general, carrier dogs do not have features of the disease but when bred with another carrier of the same Mutation, there is a risk of having affected pups. Each pup that is born to this pairing has a 25% chance of inheriting the disease and a 50% chance of being a carrier of the PRCD gene mutation. Reliable genetic testing is important for determining breeding practices. Because symptoms do not appear until adulthood, genetic testing should be performed before breeding. In order to eliminate this mutation from breeding lines and to avoid the potential of producing affected pups, breeding of known carriers to each other is not recommended. Nova Scotia Duck Tolling Retrievers that are not carriers of the mutation have no increased risk of having affected pups. However, because there are multiple types of PRA caused by mutations in other genes, a normal result in PRCD does not exclude PRA in a pedigree.